What do you do when the government refuses to pave the local road? Essentially, it makes more business sense to sail the longer distance – even though the Suez Canal shortens the Europe Asia trade route by at least 9,000 km – and burn more fuel by increasing speeds. With oil touching $30 a barrel, a recent analysis by SeaIntel, a maritime monitoring group suggests that if shippers can accept an extra week of transit time by sailing south of Africa, it would save them an average of $17.7 million a year per vessel, in transit fees. According to the analysts the Suez Canal would need to reduce fees by around 50% – and the Panama Canal which similarly affected by 30% – for crossing to be commercially viable for long-haul ships. That’s bad news for Egypt, which spent $8 billion on expanding the Suez Canal, opened with much fanfare last year. The expansion, accomplished in a record one year, was intended to reduce waiting times from 18 hours to 11 hours. Authorities said they expected canal revenues to more than double from the annual $5.5 billion in 2014 to $13 billion by 2023. On a related note, if you are interested in shipping and global trade be sure to read Marc Levinson’s The Box: How the Shipping Container Made the World Smaller and the World Economy Bigger. I recently picked it up and really like it so far. 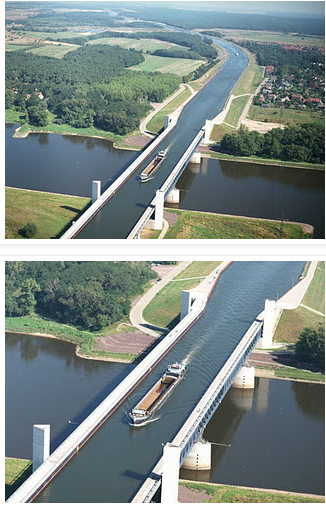 Introducing the Magdeburg Water Bridge in Germany.